Experienced traders usually do not do Intraday trading they want to hold the stock up-to a certain time and sell. This is swing trading. There is no definite difference between swing trading and investment. However a stock held for less than two-months is swing trading and above that becomes investment. Some people have the habit of swing trading with futures, in that case even if they keep rolling the future for months it is still swing trading. In fact all futures trading is swing trading whether intraday futures trading or keeping the positional futures until expiry. However Option trading is not swing trading whether you buy or sell options, positional or intraday. Option trading is pure trading. In this article we will learn Swing Trading Rules. 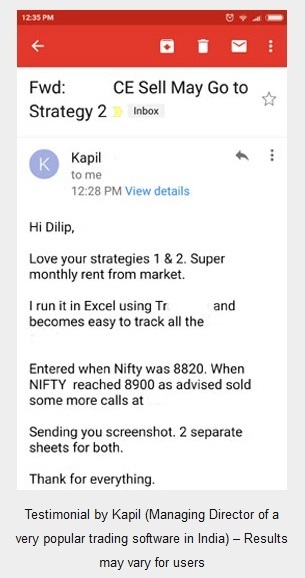 If you have Rs.1 lakh in your trading account then your loss should not exceed Rs.1000/- per swing trade, but your profit goal should be double of that which is Rs.2000/-. If you follow the above mentioned swing trading rule you will make money even if you are 50% right in your direction. Here is simple math for you. Risk management is VERY IMPORTANT in stock trading or investing. Those who do not follow the risk management are BIG LOSERS. Swing trading is an art not science. Yes it is always better to have some knowledge of candlesticks but after that the art of managing your trade comes in. This comes with experience. It’s not like intraday trading where everything is clear in a few hours or even minutes. Swing trading requires a very different mindset. You have to be patient if the trade is going against you. Once you have done your research and have selected the stock to trade, your targets and stop loss you have to set the targets and stop loss in the system and forget. 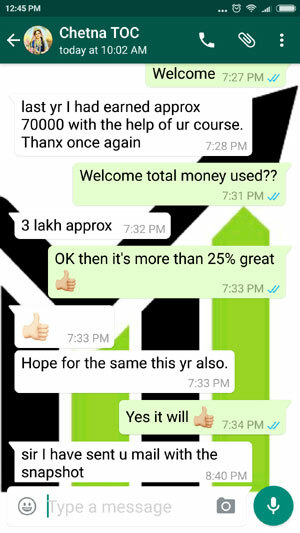 Unfortunately in India overnight stop loss is not allowed therefore you must learn to hedge your future position. Hedging ensures that profits from futures are intact but losses are reduced drastically. If you are doing it in stock holding then you have to monitor the stock everyday. But once you have decided the target profit and stop loss position you SHOULD NOT change them once you have taken the trade. The above needs lots of patience. Do not take a stop loss as soon as you see your position going into red, or do not take a profit as soon as you see your position going into green. Let the trade decide where it wants to go. If your research is good 70-80% of the times your target will be hit but there will be volatility. You needs patience to ride the volatility. There can be only two outcomes – either loss or profit – DO NOT DISTURB THE TRADE IN BETWEEN. Micromanaging swing trades is best way to lose money trading. It gives stress and you either take an early profit or loss both are wrong. Watching every tick makes you emotional and it will force you to exit the trade before stop or target is reached. It’s much easier just to set price targets in the system and leave it. Some brokers give alerts. You can also use this alerts to know what is happening to your trades, but alerts should be near your targets or stop loss so that you get alert for next trade. Lots of new traders want to try intraday equity day trading. For intraday trading 5-min charts are good to follow but for swing trading 5 minutes charts should not be followed. Focus on hourly, daily, and weekly charts. It is even more better to focus on weekly charts if you are trading in stocks not in index. If you are a futures trader it is very important to learn hedging. In my option and futures course there are two strategies where you can learn how to hedge futures with options. This strategy will help you to trade futures without fear of losing too much money as options will take care of the losses. So loss are limited automatically and profits become unlimited. 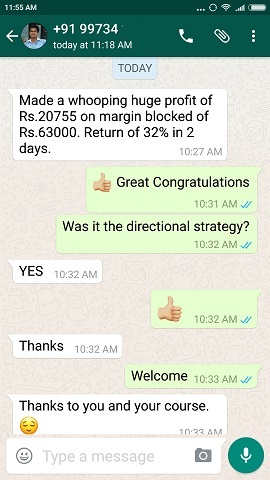 In fact even if you are very wrong in direction prediction then also you can make money even after losing money in futures. You can enroll for the course here. Note that when you are trading for higher time frames like weekly, the your profits and loss should be bigger in terms of percentage. Like you can go for 5% profit and 3% loss. Momentum mid-cap stocks are likely to move that fast in one week time. Moving averages helps to manege risk. For longer time frames use the 50 days moving averages. Moving averages gives better entries. Momentum stocks more often will come back into their moving averages. Then tend to come in the 20 or 50 days moving averages before making their next move. If a stock has broken moving average there is a high chance it will come back to its moving average. ICICI Bank Book Profits, written on October 9, 2015. 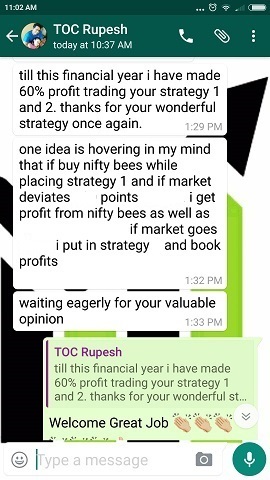 I have long back stopped writing this as I decided to keep giving good education to help my site visitors become good traders on their own not depend on anyone for tips. This trade and the ones I take personally are taken based on moving averages. Why I stopped writing about stocks that can go up in near future in my blog? The answer is obvious. Problem with newsletter readers is that they expect 100% times the stock to move up from the exact place I told them them to buy. At that time there were more than 9000 free newsletter subscribers. If the stock used to go down even 1% from the buy price I used to get slanged by readers. This is natural and it can happen, but it was impossible to reply to thousands of email that called me by names. So I decided to stop it. Well partial profits is not possible in one lot future trading however its possible if you are buying stocks. Momentum stocks trends for weeks or months. It is foolish to leave money on the table. You can keep partial profits at 3%, 5% finally 10%. This will allow you to let the winners run, while taking profits in the process. This will make you less emotional, since you will not regret thinking “I should have took profits there”. Once you have booked a partial profit move your stop loss to buying price so that ultimately you end up making profit in the trade. However there is no partial loss. You have to exit at the loss percentage you have decided. For more information you can read How To Trade Momentum Stocks. Thanks for reading and I hope you learned about swing trading. If you have any questions ask in the comments section below.